Resonus has marked John McCabe's 80th Birthday Year by issuing his complete organ music on CD (possibly, in view of the title of the album, that should be 'compleat' organ music). 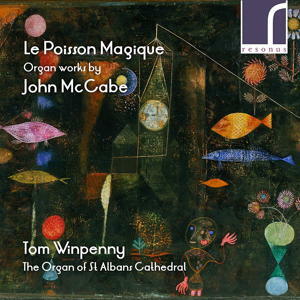 News of this recording, superbly performed by Tom Winpenny on the Harrison & Harrison organ of St Albans Cathedral, cheered John's last year, but it was previously only available as a download. Despite suffering from the brain tumour which was to kill him, John wrote the programme notes for the recording himself. One of his most lasting works has been his Dies Resurrectionis, written for organist Gordon Thorne in early 1963, and Tom Winpenny will be performing this piece, along with works by Francis Grier and a new commission by Judith Bingham, at Temple Church in London, at 1.15pm on 15th May 2019, as part of the London Festival of Contemporary Church Music. The Resonus CD includes works ranging from the Sinfonia of 1961, to the Carol-Preludes of 2008 and Esperanza of 2010. This latter was named after the amazing rescue of 33 trapped miners from a Chilean mine. The CD, handsomely produced by Resonus, and with over 71 minutes of music, is available on RES 10144.